I'll come to thee by moonlight, though Hell should bar the way. Tempsford Airfield was the base for some of the most secret squadrons of World War 2. They specialised in the delivery of agents either by parachute or by landing at night in a moonlit field, usually by the light of just three torches. The squadrons also conducted 'pick up' operations, again landing in the chosen fields to collect agents who needed to return to England. Agents in the field needed equipment, and the Tempsford Squadrons supplied it; they delivered arms, ammunition, radios and other equipment to the resistance movements in German occupied countries. These Squadrons acquired, over the years, various nicknames. They have been referred to as the Moonlight Squadrons, The Cloak and Dagger Squadrons and, perhaps somewhat tongue in cheek, The Tempsford Taxis! 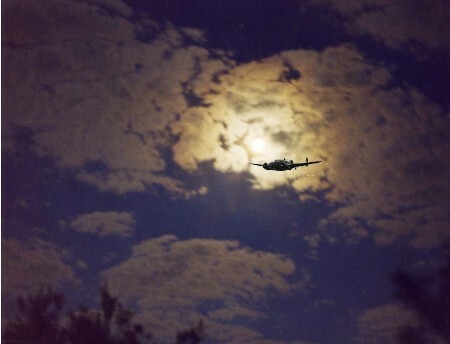 More than 70 years have passed since their formation, and it is time to bring these moonlight squadrons into the daylight so that their efforts and sacrifices are recorded and acknowledged. This site will continue to grow as more information becomes available. Suggestions for its improvement and areas which should be included are always welcome. If you have a story to share or are looking for information, please do not hesitate to make contact either by e-mail or by an entry in the Guestbook. Did one of your relatives fly from Tempsford? If so, please email me - we would love to hear from you!